Ok. so task 3 is meant to take you out of your comfort zone. And I’m so grateful for it, as it’s opened space for us to grow together and for my awareness of the abundance within the community that already surrounds me. 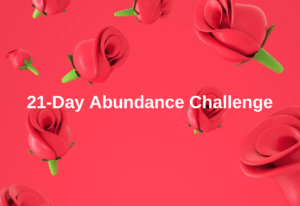 In truth, 21 days of challenges can be daunting, making time for ourselves, and our growth, taking a moment each day to feel into our hearts truest desires and move with the intent of Abundance, as opposed to scarcity, but can also be a brilliant exercise. Today’s task is a decisive junction in this journey and I’m seriously hoping that you’ll persist with it. You’re now charged with forming your own Abundance Group. It won’t need many members, the more the better, but 3 is enough. You’ll have the mission each day to coach and pass on the guidance from Day 1 to the end of the 21 days to at least 3 people because 3 is the smallest group you can form. Let me know should you have difficulties with the technical aspects of this. There’ll be someone who can assist you. – Choose a photo for a profile picture that is representative of Abundance to you. – Invite your friends to participate before you add them to the Group. Invitation: It is important to explain the Group’s intention and make it clear that they will have daily tasks and deadlines for delivery. The guest should be willing to participate. To facilitate, you can take advantage of the previous messages that I passed, like rules, exercises, etc, with a touch of your personality. Remember that you will have to make the postings daily and follow the people who have been doing the tasks. Huge responsibility. This task for some can be frightening, for the extra commitment in the life full of tribulations but, mainly, for the ego and its fear of rejection. Allow your love to expand as you feel it can contribute to people’s development. 🔸️If you have difficulty getting members of your groups, let me know. You can copy and paste the messages that were sent here. You’ll have to remind yourself to check in. Anyway, I will hope you can do it, but I will understand and respect those who do not think it is the moment to continue with this challenge.